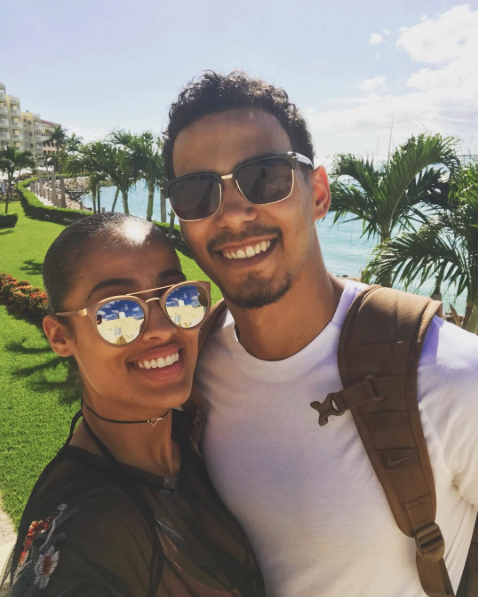 WNBA Star Skylar Diggins Enjoys A Romantic Baecation With Her Fiance and They're Super Cute! Now this is how you take a break from wedding planning! The countdown to the big moment at the altar for WNBA Dallas Wings star Skylar Diggins and her fiancé Daniel Smith is on, but the happy couple isn’t waiting on their wedding day to arrive to have a little romantic fun. While Diggins gears up for the upcoming season, she’s taking a much needed break from wedding planning and spending QT with her man. And, what better way to have some fun in the sun than with a trip to the Caribbean?! The college sweethearts decided to enjoy some quality time in St. Maarten showing us what a baecation should look like on Instagram. From walks on the beach boardwalk, an afternoon swim and jet skis these two know how to have some fun. As we were tearing up the waves on our jet ski tour, we were challenged to climb and jump off the rocks! I'll take the jump with him every time! Last June, Daniel proposed to Skylar at his art exhibit. The two have been together since their college days at Norte Dame and are planning to wed before the new season kicks off. On June 12th, 2016 I made the best decision of my life. I rarely open up and share, but I woke up this morning feeling blessed and highly favored by God's grace. Skylar, you're the love of my life! Our love is more than skin deep, our love comes from within and from above. I can't wait to grow next to you and receive all the blessings God has in store for us. I love you! 🌹 I was taught how to love by my father, my mother and three sisters. All beautiful souls, thank you for leading by example. I will always look back to your example as Skylar and I embark on this journey together. I promise to always be the man God created.